GEBSON is proud to launch on Saturday June 6, 2009, its first wristwatch collection bringing together cultural symbolisms and 100% Swiss made watch-making art. Based in Neuchâtel, this new brand is also opening its web site www.gebson.com on that same day. This new brand has been founded in 2007. It is part of the Geb Group Ltd that belongs to a family renowned since three generations for its most complex watch cases. The idea to create an independent brand emerged from several private clients and collectors who asked for exceptional and highly emotional timepieces. 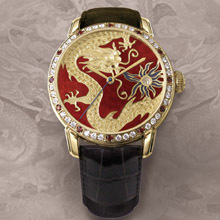 The sales of these überpremium wristwatches – either unique pieces or limited editions of a maximum of 8 watches – mainly occur between the brand and its exclusive customers, without intermediaries. Gebson’s creations gather local artistic references, cultural symbolisms, and historical traditions. For its first collection, the brand has drawn inspiration from the Chinese culture with its more than 5000 years of history. Mixing the ancestral crafting techniques of “champlevé” enamel (a gold dial plate engraved by hand and decorated with enamel) or of enamel painting with highly skilled gem setting techniques (diamonds, sapphires, garnets, and other coloured precious gems) and different precious materials (white gold, rose gold), these timepieces, moved by Swiss automatic movements, are made to seduce art lovers who aspire to carry a mechanical wristwatch made in the purest Swiss watch-making traditions. 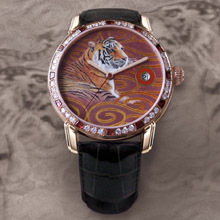 For its first gent collection, called “Sky and Earth”, Gebson proposes several prestigious timepieces with a dragon or a tiger on their dials, symbolizing strength and power. 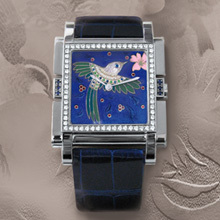 For the ladies’ collection, the “imagination and inspiration” series represents the grace and providence through a phoenix or a flying bird. But the new brand also seeks to fulfil its customers’ most personal and original wishes. Thus, each client willing to customize his timepiece is invited to take part in designing it, bringing his cultural references and aspirations that the craftsmen of Gebson will translate in an outstanding object, encounter of desires, imaginary and luxury worlds.